MOVINGLight®, a technology patented by Prodways, is a process of photopolymerisation to produce prototypes or functional parts with a very high resolution and at very high speeds, by polymerising the photosensitive resins with moving DLP (Digital Light Processing) UV rays. High-resolution 3D printers are ideal for manufacturing prototypes that require very high detail. 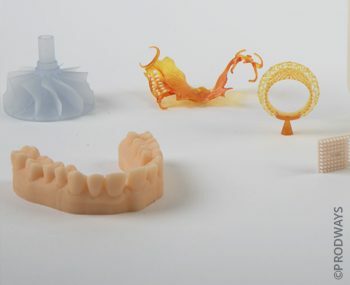 But they are also designed to produce parts for various applications such as jewellery, dental models or surgical guides, lost-wax casting, moulds for injection, thermoforming and blowing-injection, and moulds for insoles. The moving DLP of Prodways’ MOVINGLight® technology projects a 40 x 70 mm image made up of 2 million pixels which sweeps across the entire surface of polymer resin. This results in a very high active resolution of 40 microns per pixel on every part of the build platform.Once one layer of the material has solidified, the platform drops to the value of the thickness of the following layer and a new section is solidified. In this way, there are as many cycles as necessary layers so as to obtain the full volume of the part. The largest Prodways 3D printers thus reach a record number of more than a half-billion pixels per layer, delivering incredible precision and high resolution without increasing costs or production time.